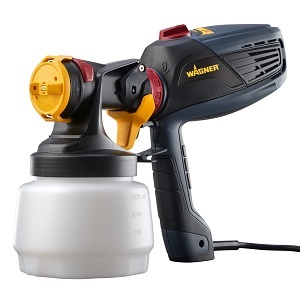 Finish your painting projects fast with Wagner’s most powerful DIY sprayers. New & Improved Sprayers. Q: What types of coatings can be sprayed through the FLEXiO series? 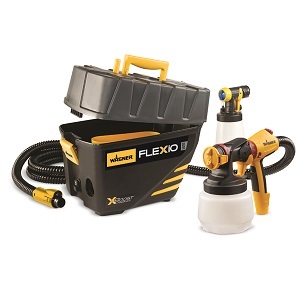 A1: The FLEXiO Series will spray water-based or oil-based paints and stains. A2: Do not spray or clean with liquids having a flash point of less than 100ºF (38ºC), reference the paint can. Flash point is the temperature at which a fluid can produce enough vapor to ignite. Q: What is the iSpray nozzle used for? 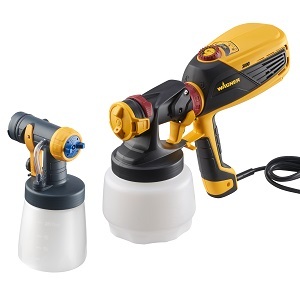 A: The iSpray Nozzle, which will spray unthinned coatings including latex paint and stains, is ideal for big surface projects such as spraying walls, sheds, fences etc… It will provide a roller-like or slightly stippled finish. Q: What is the Detail finish nozzle used for? A: The Detail finish nozzle is best used on your fine finish projects such as spraying cabinets, furniture, doors, trim etc. It will provide a smoother, finer finish than the iSpray Nozzle. Depending on your material, the Detail Finish Nozzle may require some thinning of your material in order to spray properly. Q: What should I use to clean my sprayer? A: When cleaning, use the appropriate cleaning solution (warm, soapy water for latex materials; mineral spirits for oil-based materials). Always check the back of the paint container for appropriate cleaning solution. 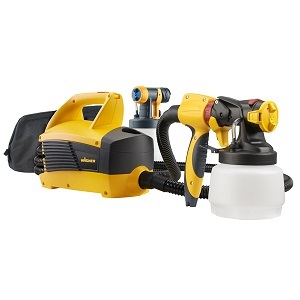 For more information on cleaning your paint sprayer, see our helpful Clean-Up Video.